Lemonade Pockets: What's the benefit? My mum was in the market for a new mascara, and succumbed to They're Real mascara from Benefit. Claimed to be the UK's no. 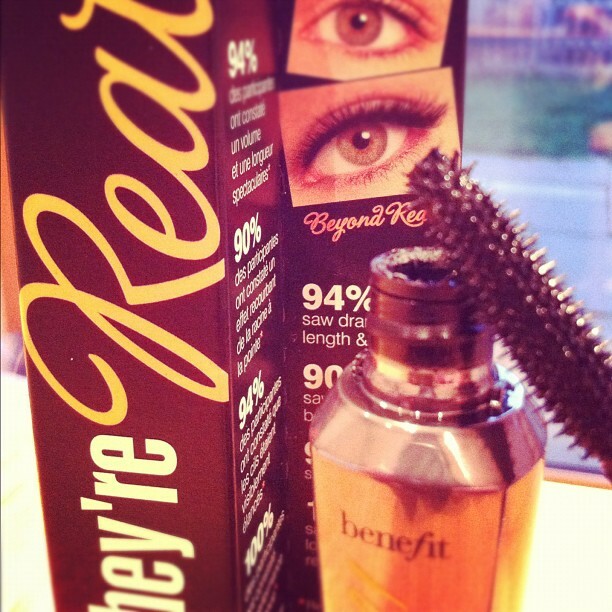 1 best selling mascara, I've just tried hers, and I'm impressed. It claims to lengthen, curl, volumise, lift and separate - a big claim for such a little wand. But I think this mascara really does deliver. It has a ball of spikes on the end of the wand which are great for covering the tiny 'invisible' lashes which exist at the outer and inner corners of the eye, and the main wand gives good coverage to the central lashes. The mascara is quite wet, and takes a confident hand to apply and give a couple of coats - those less skilful might take a bit of getting used to it. If you're having problems with lashes clumping together, hold the wand vertically and use to separate and curl the lashes. But the mascara lasts, and doesn't drop. A rare occasion where a product actually lives up to its hype.